In the second part of our interview with Timothy Papandreou – Director of Strategic Planning & Policy at the San Francisco Municipal Transportation Agency (SFMTA) – we asked him about car-free streets and ecomobility. Q: You attended the EcoMobility Festival in Suwon, where the neighborhood was closed to cars for a month. How was it? 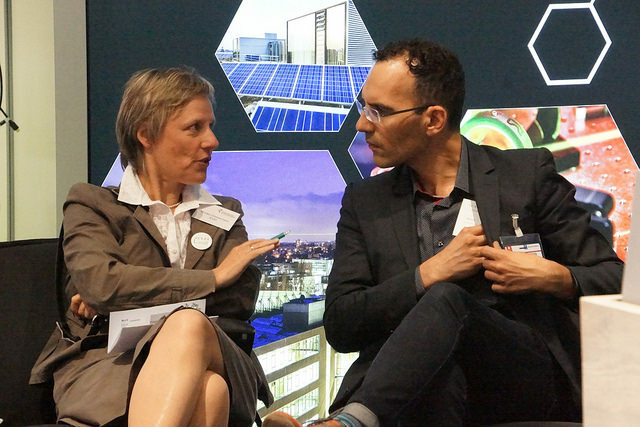 Timothy Papandreou talks with ICLEI Deputy Secretary General Monika Zimmerman at Metropolitan Solutions 2015. TP: It was such an amazing experience to see a neighborhood actually cordoned off from cars, but thriving. Everybody was walking around, bicycling, using all forms of bicycles: there were bicycles, tricycles, quadricycles, and so on. There were definitely some tensions there, and some people were still not sure about it. But the best part was seeing the grandparents walking with their grandchildren, and the parents just feeling free to hang out with their friends and just chill, while the grandparents and little kids were playing in the street. That is, to me, what we mean when we talk about smart cities. Q: Do you think it has the potential to be replicated? TP: Oh yeah! Nothing that was done in Suwon seemed uniquely “Suwonese”. It seemed like it was obvious that you needed three things: you needed the political leadership, the business leadership (because someone has to pay for this) and then the community acceptance. And they seemed to have just enough to get them over the line. There were some communities that were not accepting of it and some that were. I was told that the first week was a little weird, but by the second week people were giving all of this anecdotal evidence about how they had literally changed their behavior, because they had either seen their friend change, or they had changed out of necessity, or the children had required it because they wanted to play in the street longer. So it has also brought people out of their apartments and onto the street for a couple of hours per day. They say that they don’t remember doing that since they were kids, years ago. 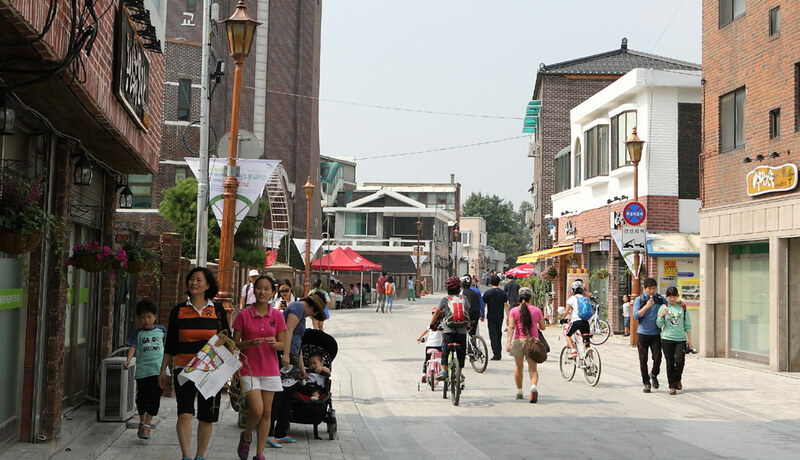 A car-free street in Suwon during the EcoMobility Festival 2013. So I think that is very replicable, because there is nothing that was unique to them. It was a moderately low-to-middle income area. It had the same land-use as most cities. And there was just this willingness to cordon off an area and just try it out, which was great. TP: Yes. When we closed our bridge down for repairs, we made a point of having a little celebration under the bridge. Everyone was sitting there saying: “I can hear birds now; I can hear footsteps; I can hear people singing and dancing and laughing.” And normally you just hear the roar of the cars. So we try to have those experiential things, to see what that’s like, because it’s hard to imagine a world without cars. But there were places without cars for a long time. 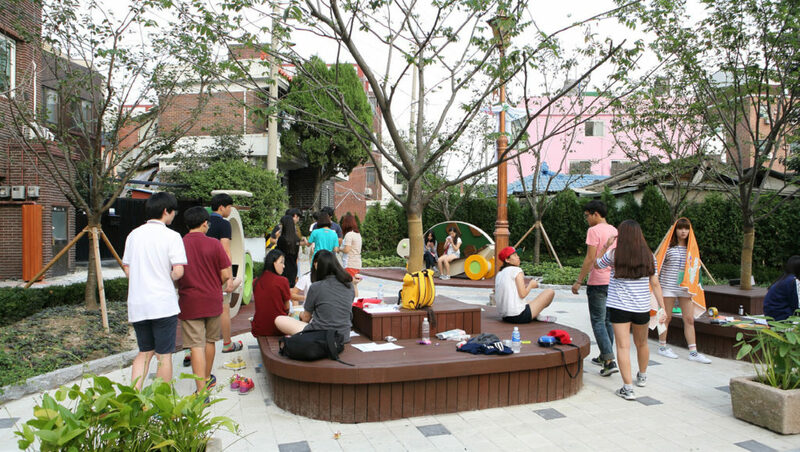 Areas previously designated for parking were redesigned as pocket parks and public spaces for residents to enjoy. © Suwon City Council. Q: Do you think there is always a risk of making cars the enemy? TP: Yes, I never see the car as the enemy. The car isn’t the enemy so much as the use of the car is the question. People have the right to own cars. You are just trying to minimize their use. And unfortunately, cars are 20% occupied at the best of times, so 80% of the seats are left over, and they are only used for around one hour per day. That is really inefficient. If we could double the occupancy and use during the day, a) we would probably eliminate congestion in the city, b) it would be more affordable for everybody, and c) there won’t be a problem, because there are not that many cars left over. That doesn’t require everybody to change their behavior; we would like just 10% to consider changing their behavior just 1-2 times per week. That would make enough of a difference to get cities moving. Cities are not moving any more: they’re just stuck. Everybody wants mobility, nobody wants to pay more than they should for parking, no one likes the inconvenience of traffic, and no one likes car collisions, so someone has to do something. Q: There is a solution there. TP: Yes. Honestly, I don’t think it’s a transportation planning solution; I think it’s a marketing solution. It’s a behavioral, psychological, marketing solution, and we just need to test it and try it out. The EcoMobility Festival 2015 takes place in Johannesburg, South Africa, in September. Please visit the website for more information!